We finally got a date and location for our Fall Meet-Greet-Shoot. 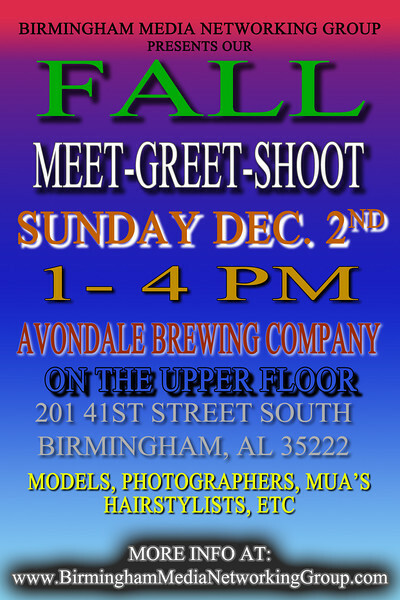 So its gonna be Sunday December 2nd from 1-4pm on the upstairs floor of the Avondale Brewing Company. Its a great venue for our event, its the same location that we used in the spring, and if you haven’t been to the Avondale Brewery or had a chance to sample their beer, you definitely have something to look forward to, beside our event. We have the upstairs room reserved, and to get to that room, you must pass through the main floor out into the courtyard behind the building and then up the back stairs. The room takes up the whole floor. A shot from the door into the large upstairs room. Looking out onto the courtyard from the stairs leading to the upstairs room. Also you can see more photos from our last event at Avondale here. Well as stated above we are gonna host our second BIG event this year in about 3 weeks (from this original posting). Even though our group has Birmingham in the name we have a number of members from all over the state (Fort Payne, Anniston, Tuscaloosa, etc) so please don’t think we only want local people. With this Meet and Greet, shooting is completely optional. We wanted to use a venue in which shooting is possible, but we want everyone to know that they are NOT REQUIRED to shoot. Come out, mingle, talk and get to know the photographers, models, stylists, etc. in the area. The old adage about “its who you know” still applies, and just by having profiles on model sites, it doesn’t really doesn’t mean you know anybody. Making a good impression in person, that is memorable, can sure go a long way. It’s a NO-PRESSURE environment meant to encourage everyone to have fun while getting their work seen by more of the local community.